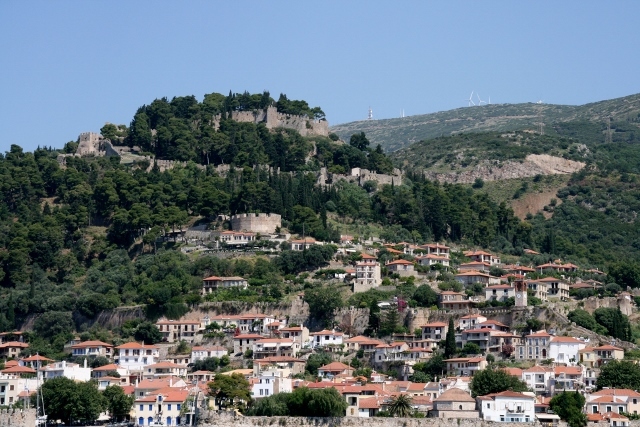 We leave Patras and head into the Gulf of Corinth, we pass under the Rion-Andrion Bridge. We call Rion Traffic at 2 miles out and also at 1 mile out and they tell us where to pass. Heikell says the bridge is the longest cable stayed bridge in the world 2,252 metres long with three navigable channels. Strong currents are a known challenge in the gulf. We proceed to the tiniest port we have ever encountered, a magical, fairy tale sort of place with a lovely beach and views out to the Rion Bridge and a Venetian castle. 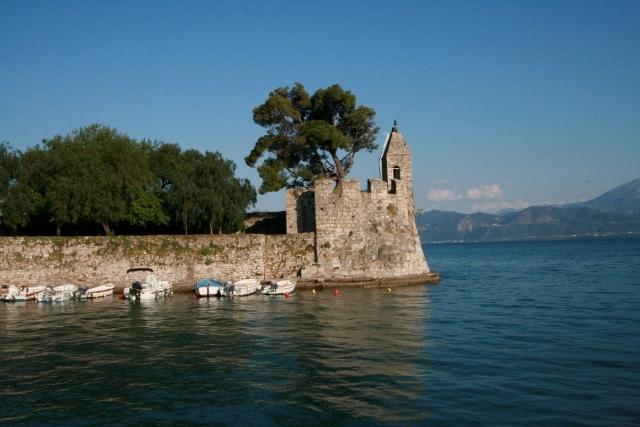 The Greek name is Navpaktos and when the Venetians were here it was called Lepanto. We pulled into the minute port and could not see a berth open but then some of the fishermen pointed to a spot. We literally went back out to the opening to drop the anchor, just at the entrance and backed onto the town stairs. Mercier docked in the small but perfect port of Lepanto. 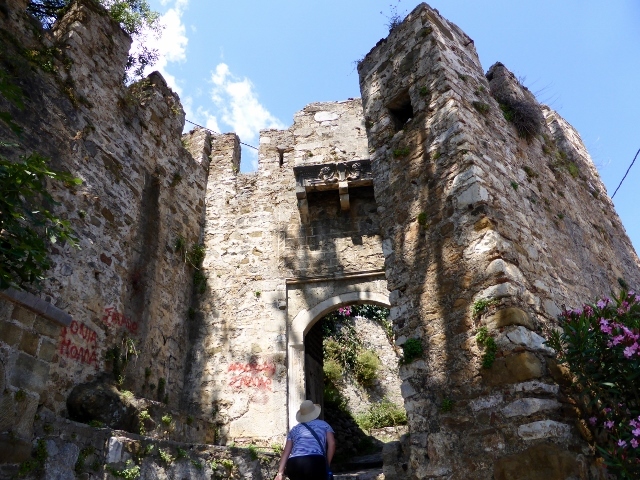 We found great food, Greek lessons and lovely gelato at Andrea’s and a secret garden just inside the Bastion walls. We tried to walk to the top of the castle but only made it up to the third bastion or maybe half way. We seemed to end up in private yards. 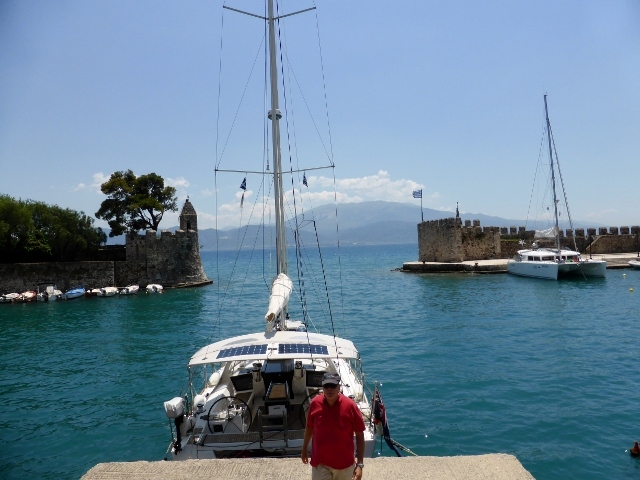 We were sad to leave Lepanto, it is so gorgeous and we didn’t really have enough time there to explore its history, Leanne and I decided we would go back even without a boat. The beaches are pebbly but very nice. A castle walk to help us burn off all the lovely food. We sailed to Trizonia, which is a marina the GFC left half finished. But a number of yachts find their way here for a night and walk into the town to visit the tavern’s. 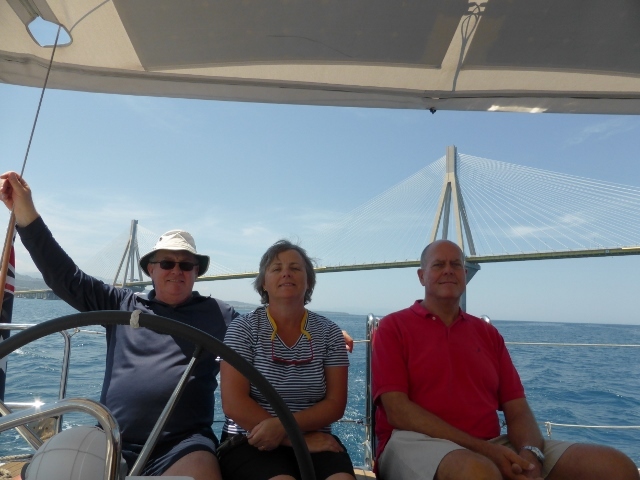 We were welcomed by Greg and Julia of Mojo, who joined us for an enjoyable drink at sundown with quite a bit of information about sailing in Greece and going through the Corinth Canal. We had one more night in the Gulf of Corinth in Kiator moored to an old town wall, we were able to have a delightful swim off Mercier and then find a taverna roasting the Sunday lamb on the spit. We had a delectable dinner followed by a walk on the beachfront.